What Will I Learn in an Online Web Design Program? 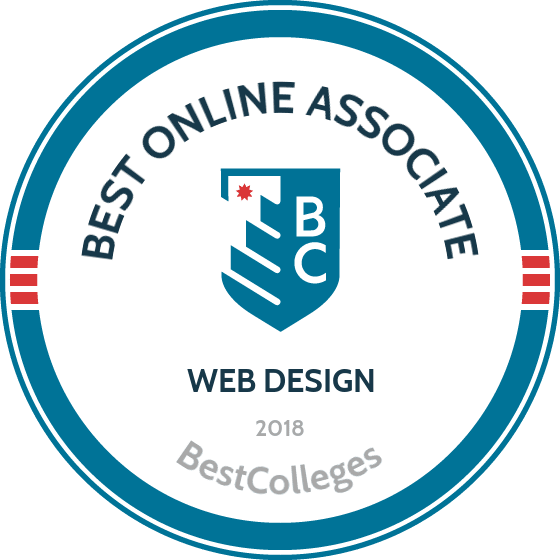 What Can I Do With an Associate Degree in Web Design? Earning a web design associate degree opens doors to one of the fastest growing and most creative careers available. The skills gained from an online degree in web design lead to innovative, fulfilling positions that allow creative freedom. According to the Bureau of Labor Statistics, the web design and development field will grow 27% by 2024. The average salary for web design professionals is $66,000 per year. The synchronous course delivery requires students to log on daily for weekly assignments, quizzes, and tests and to participate in real-time class discussions. All online students pay the same affordable tuition rate, regardless of residency, and may apply for the BSC Chesak Family Scholarship. CGTC offers a web design associate degree online, which requires 64 credits comprising general education courses and occupational web development courses, such as information security fundamentals, scripting technologies, and introduction to Oracle databases. Students develop skills necessary for positions as web designers, and online students have access to career services and tools to help them pursue career goals. Online students must complete an academic activity each week to meet attendance requirements. Enrollment is open to high school graduates or GED recipients who are at least 16 years of age, and the program offers start dates each semester. Georgia residents receive discounted tuition. GNTC, a 2010 expansion of the Georgia Northwestern college system, provides accessible, high-quality technical education. The website design and development associate of applied science degree emphasizes concepts, principles, and techniques of web development and program design. Most students complete the 64 required credits--15 credits of general education and 49 credits of occupational courses--in two years. GNTC online students have access to electronic resources, virtual services, and library support services. The career services office helps students and alumni navigate employment opportunities, providing assistance with résumé and cover letter preparation, interview training, and job searches. Georgia residents pay discounted tuition rates. HVCC is the second-largest provider of higher education in the Capital District of New York. With 25 online degrees and certifications available, HVCC is also a popular choice for distance learners. For aspiring web designers, HVCC offers an online associate in web design and WWW programming, with fall and spring start dates. Online courses allow flexible scheduling for the completion of weekly assignments. Primarily designed for students who plan to enter the workforce immediately after graduation, the program emphasizes information systems and business and provides instruction in web design, development, usability, and internet technology. Online students pay in-state tuition rates. More than 90% of SPC graduates find employment in their desired field or continue their education. SPC boasts affordable tuition rates and allows students to earn up to 45 credits through exams, previous industry certifications, and real-world experiences. SPC’s online associate degree in digital arts, media, and interactive web design is ideal for students who plan to pursue employment in the digital technology industry. Students customize their education through a 15-credit subplan in digital media/multimedia presentation, video production, video game foundations, or graphic design. Students earning their web design associate degree online are prepared to work as digital multimedia authors, desktop publishers, web developers, or multimedia artists and animators. EGCC’s online internet and interactive digital media design program combines the study of web design, internet technology, digital animation and graphics, and computer programming with vital business knowledge and communication skills. Graduates are prepared to pursue employment across the web design industry. Students create a portfolio to use in their job search, which includes work displayed on websites, digital graphics, animations, programs, and work in print and electronic publications. EGCC offers the fourth-lowest tuition rates in Ohio, making courses affordable for both residents and out-of-state students, although Ohio residents do pay slightly lower tuition rates. Applications are accepted on a rolling basis. RCTC offers a wide selection of associate degrees, each with liberal arts cores and areas of emphasis in art, graphic design, photography, and web design. The web design degree requires 60 credits: 30 in general education and 30 in the program core. Elective options in digital art, animation and 3D modeling, and graphic design offer additional digital technology experience. RCTC online students may begin their studies at the start of any semester, though some courses are only offered once a year. Minnesota residents and out-of-state students pay the same tuition. Distance learners must consult with an academic advisor and complete RCTC’s virtual student orientation prior to course registration. LCSC is a public, four-year college based in Lewiston, Idaho, and offers associate degrees, bachelor’s degrees, and certificates online. The eLearning services department facilitates and manages the school’s web-enhanced, hybrid, and online instruction. LCSC offers a fully online associate of applied science in web design and development, which requires 64 credits: 15 in general education and 49 in major courses. Major courses cover subjects such as web authoring, data processing tools, and collaborative and solo web development projects. The program culminates in an internship to ensure students understand contemporary front-end and back-end web technologies. Graduates design, develop, and manage modern business websites and applications. Located in the eastern California city of Ridgecrest, CCCC offers affordable associate degrees, including 18 online associate degrees. The web professional associate of science degree focuses on coding and scripting, creative problem solving, project management, and software such as Adobe Dreamweaver and Adobe Photoshop. Students are exposed to real-world work conditions through collaborative and individual projects. Graduates work in website design, content management, mobile web development, and ecommerce. Online courses are available to all U.S. residents, except residents of 13 specific states. California residents pay discounted tuition rates. Online students may take classes in fall, spring, and summer. HACC has offered online learning opportunities since 2004. First-time freshmen, transfer students, and experienced professionals will all find online opportunities to advance their academic and career goals. Web design curricula vary depending on the program's specialties and strengths and the school's resources. Below is a list of core courses found in most web design associate degree online programs. Introduction to web design: This foundational course covers the basics of web design, HTML, and CSS scripting. Students learn about style, typography, and contemporary scripting methods. Mastery of this technology results in high-quality, interactive websites that function properly on mobile devices, tablets, and computer screens. Internet marketing: Students explore practical marketing skills for growing online businesses. They configure information for targeted audiences through email marketing, website planning, search engine optimization, and social media strategies. Web typography: Students explore techniques for styling, typesetting, and manipulating text. They create readable, flowing text and type-based graphics. This course helps students create clear visual communication that is powerful, eloquent, and aesthetically pleasing. Graduates with an associate degree in web design pursue careers as multimedia or social media specialists for start-up companies or work as designers or media consultants at established companies. Other professionals with web design associate degrees work as self-employed freelancers who set their own schedules and deadlines. Professionals in this field are often self-starters, have a meticulous eye for detail, and enjoy seeing a project through to completion. Successful web designers follow instructions well, work with others on collaborative projects, and handle constructive criticism. Graphic designers often work in collaborative environments to design logos, original images, and illustrations. Graphic designers typically work on multiple creative projects simultaneously. Art directors develop the visual style and layout of magazines, advertisements, and product packaging. Some design visuals for movies and television. These professionals work with both hardcopy materials and digital visuals. Many positions require knowledge of current advertising trends, fashion fads, and pop culture to target specific audiences. If you plan to pursue upper-level roles, such as senior user experience designer or software engineer, consider earning a bachelor's degree in web design. Many four-year programs accept up to 90 transfer credits from accredited two-year programs. Bachelor's degree programs help students hone software skills and specialize within the field. According to PayScale, the median entry-level salary for web designers is $46,000 per year. A bachelor's degree allows you to pursue higher level positions with median salaries of $103,000 per year. Professional organizations create opportunities for both new and established web design professionals. For those earning their web design associate degree online, attending conferences and professional gatherings expands business networks. Annual conferences often include events and workshops for new professionals in the field. These services and networking opportunities help professionals make long-lasting contacts, advance their careers, and keep up with new technology. This conference for digital thinkers unites the best design agencies and leaders in digital design. The conference is held in a different city each year and offers an opportunity for new and established web designers to network and hear keynote speeches from the top minds in the field. This organization provides worldwide access to resources and networking opportunities. It emphasizes the development of community among web designers, with the hopes of sparking innovative collaborative projects. This interdisciplinary conference unites technology-based professionals with those in the humanities and liberal arts. Apple offers expert feedback on attendees' works in progress, hands-on lab technology exhibits, guest speakers, and networking events. In addition to education level, professional experience impacts the annual earnings of professionals in the web design and development field. The table below shows earning potential based on experience level. Graduates with a degree in web design can expect steady salary growth over the course of their careers. Consider all financial aid options before beginning a web design associate degree online program. Many distance learners receive financial assistance through their school or an external source. Be sure to complete the Free Application for Federal Student Aid, or FAFSA, to be considered for federal financial aid. Research the variety of external funding opportunities, including scholarships, internships, and grants, for students studying web design.